have a good day, Juli! I love the laid back look! The messy bun and everything to it. I love comfy stylish clothes. :) Great style! mencanta! super sencillo pero a la vez super chic! Very inspiring, love the shirt!!! I'm in a modeling competition and need as many VOTES as possible...Voting starts tomorrow at 5PM! So please please if you have some free time help me out it would mean the world to me...you can vote as many times as you like the more the better!!! Amazing photographs! New follower - just because of the feel I get from the photos! Love it! (and those ray bans are awesome! loving the photography work here! Amazing post!! thank you for visiting my blog! we are follow you now! pls follow back! love this plaid shirt...perfect one;)! I like the watch ! i love ur shirt and shoes!! but the whole look is amazing!! 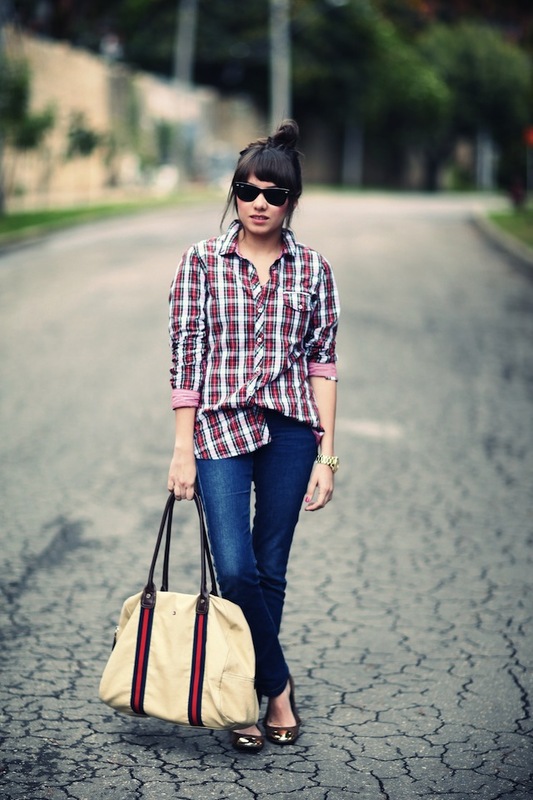 A very chic look, love the plaid shirt and the bag! Hey Juli! Thanks for stopping by my blog...come follow me hun! Yo comento muy poco pero !que guapisima estas siempre! Me encanta como se ven la camisa el bolso. Great shirt! I love this outfit! what a great outfit! i love all your accessories! super cute!!! ame tu bolso!! I love your look!! cool!! I will take your advice sweetie! Juli que lindo look! a mi me encantan las camisas a cuadros, dan un toque tan fresco! Hello, I like your look is beautiful. What a lovely casual look. I really like how you styled the plaid shirt: half tucked in and sleeved up, just perfect. Thank you so much for your comment that introduced me to your blog, so nice! p.s please check out my bebaroque tights giveaway if you have time! You look so so stunning! Your outfit is such lovely and you are so beautiful, darling! I'm following you! Hope you can also follow my blog! Love the look! So jelous of your watch! p.s. : Really like your blog! Hey, thanks for the sweet comment! I loved the shirt! Nice outfit! I do not wear plaid shirt, but I love them in others ... I like the way you carry. Your photography is beautiful! Love the gold toe of your flats! Whoua très joli look, j'aime beaucoup le chemise ! I really like the plaid shirt, it's so cute. oh i love this entry!